﻿ Isaiah 12:2 "Behold, God is my salvation, I will trust and not be afraid; For the LORD GOD is my strength and song, And He has become my salvation." 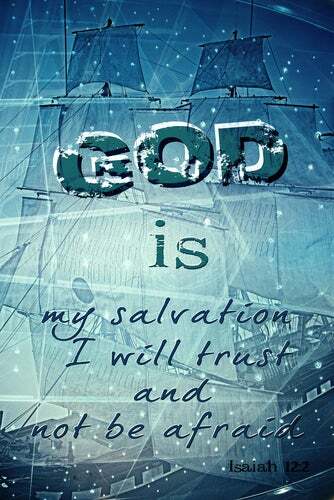 Indeed, God is my salvation. I will trust [Him] and not be afraid. Because Yah, the Lord, is my strength and my song, He has become my salvation." "Look! 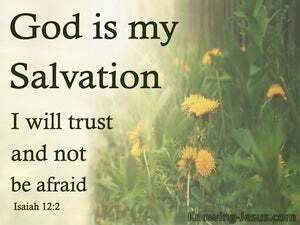 God yes God is my salvation; I will trust, and not be afraid. For the LORD is my strength and my song, and he has become my salvation." Behold, God is my salvation. I will trust, and will not be afraid, for LORD, [even] LORD, is my strength and song, and he has become my salvation. Behold, God is my salvation; I will trust, and will not be afraid; for Jehovah, even Jehovah, is my strength and song; and he is become my salvation. Behold, God is my salvation: I will trust, and not be afraid; for Jah, Jehovah, is my strength and song, and he is become my salvation. Behold God my salvation; I will trust and not be afraid: for my strength and song is Jah Jehovah, and he will be to me for salvation. Behold, God is my salvation; I will trust, and not be afraid: for the LORD GOD is my strength and my song; he also has become my salvation. Look! God [is] my salvation; I will trust, and I will not be afraid, for my strength and might [is] Yah, Yahweh; and he has become salvation for me." Behold, God is my salvation; I will trust and not be afraid for the LORD JEHOVAH is my strength and my song; He also has become my salvation. 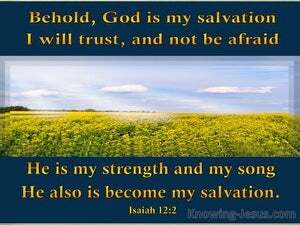 Behold, God is my salvation: I will be bold therefore and not fear. For the LORD God is my strength and my praise whereof I sing: and is become my saviour. Look, God is my deliverer! I will trust in him and not fear. For the Lord gives me strength and protects me; he has become my deliverer." Behold, God is my salvation. I will trust, and will not be afraid; for the LORD, the LORD, is my strength and song; and he has become my salvation." Lo, GOD is my salvation! I will trust and not dread, - For, my might and melody, is Yah, Yahweh, And he hath become mine, by salvation. Behold, God is my salvation. I will trust, and will not be afraid; for Yah, Yahweh, is my strength and song; and he has become my salvation." Lo, God is my salvation, I trust, and fear not, For my strength and song is Jah Jehovah, And He is to me for salvation. 1 Then you will say on that day, "I will give thanks to You, O LORD; For although You were angry with me, Your anger is turned away, And You comfort me. 2 "Behold, God is my salvation, I will trust and not be afraid; For the LORD GOD is my strength and song, And He has become my salvation." 3 Therefore you will joyously draw water From the springs of salvation. The LORD is my strength and song, And He has become my salvation. Behold, the LORD has proclaimed to the end of the earth, Say to the daughter of Zion, "Lo, your salvation comes; Behold His reward is with Him, and His recompense before Him." "But I will have compassion on the house of Judah and deliver them by the LORD their God, and will not deliver them by bow, sword, battle, horses or horsemen." But I will sacrifice to You With the voice of thanksgiving That which I have vowed I will pay Salvation is from the LORD."